‘Rocker’ means the curved rise of the tail on your ski which helps to lift the ski out of powder. There are three main types of ski rocker profile: camber, rocker, and flat. Many modern shapes use a combination of more than one of these. The more rocker a ski has, the easier the ski is to turn and the more lift it gives. If you have less rocker, it can be a little trickier to turn in soft snow. ‘Sidecut’ is the term which refers to the inner curve of the ski which gives it its hourglass shape and is often expressed as a radius (in metres). Sidecut is a crucial thing to consider when buying your first skis as the shapelier a ski is (ie- the deeper the sidecut), the tighter you will be able to turn. Skis with really deep sidecuts will be awesome for slalom but will perform less stably at speed. A less deep sidecut will allow skis to make long fast arcs and will help skis to float as it keeps them closer to the surface. ‘Camber’ is the traditional profile for skis and snowboards and is the slight upward curve in the middle of the ski you’ll see when the ski lays flat. There are many different types of camber profiles for different styles of skiing; a camber offers great precision on groomed terrain with harder snow, and you’ll find that racers and skilled park riders often prefer camber in their skis as it gives a better ‘pop’. As you unweight your skis at the tail end of a turn, cambered skis rebound to their natural profile, propelling you into your next turn – If you’ll be using your skis at a resort, you’ll probably want a ski with camber for optimum grip and stability on hard snow. ‘Flat’ means flat, simple as that! If you choose a ski which is flat when laid on a table, you won’t see any air between the table and the ski. Flat is more commonly a shape for snowboards than skis, as it helps with easy transitions and better manoeuvrability than camber. The rigidity of the skis you choose will be dictated by your ability and your expectations. The higher your standard, the more rigid your skis will need to be to make them more sensitive and “alive”. If you are a beginner, go for flexible, light skis. You’ve now decided what shape of ski to buy, but what size ski should you choose? The size of your new skis will be dictated by your height, skiing ability, and what you want to achieve. A beginner will need skis that are quite short: 10 to 15cm less than their own height for downhill skis. A good skier might choose skis which are the same height as themselves for downhill skiing (and sometimes even a little longer for freeriding). A skier’s body weight is also a factor for consideration when buying new skis. 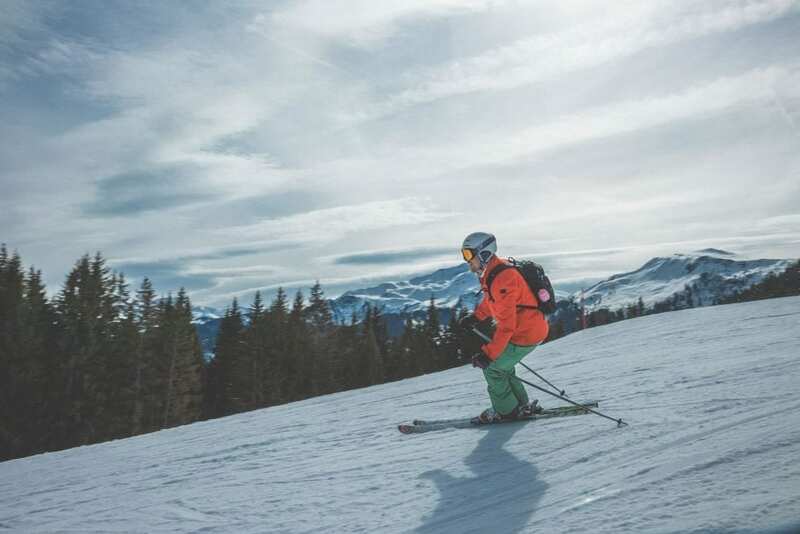 A lightweight skier will find themselves having difficulty in trying to handle skis that are too rigid, whilst heavier skiers will tire of using skis that are too soft. When choosing your first pair of skis to buy, it’s also necessary to consider bindings. Whether you prefer free skiing or powder, the type of bindings you choose will be largely dictated by the type of skiing you will be doing and the type of skier you are. Track-Mounted Bindings These are bindings which are mounted onto a track on the ski which allows them to be perfectly positioned for the size of your ski boot. Benefits of mounted bindings include the fact that the track plate allows the ski to naturally flex so more evenly distributes the force you apply when turning. If you are looking to buy new ski boots, track-mounted bindings are probably your best bet as they allow flexibility if you want to share/sell on your skis at a later date. Drill-Mounted Bindings As the name suggests, drill-mounted bindings are drilled and glued onto the ski making them a permanent fixture. This is done professionally in a ski shop or you can get them mounted in resort if you need to also. Some people think that you get a better control with drill-mounted bindings as your foot is closer to the ski itself, and the ski with drill-mounted bindings is lighter as you don’t have the extra weight of the track system weighing it down as you do with track-mounted bindings. 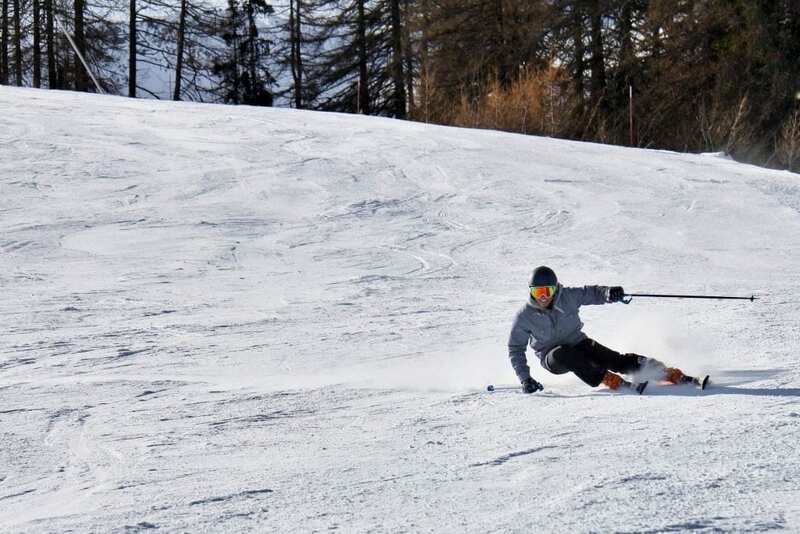 Length: If you prefer skiing on groomed pistes in Meribel, you will want to buy skis which help with performance and precision to enable the big thrills you crave! If this is the type of skiing you love, then you’ll need to buy new skis which are quite short and a blade under 80mm to assist with great response between turns. Rigidity: If you are a very able skier, then you’ll want to get more rigid skis as these will help the response and make them ‘pop’ when you’re carving up the mountain. Weight: If you’re a beginner, always go for light flexible skis, no question. Length: Average length skis are best for new skiers who don’t know what kind of skiing they prefer yet, or for skiers who just like to give all terrains/surfaces a try. You’ll want to go for an average blade width (around 80mm) and tips which verge on the large size to give better lift off-piste or on powder. Rigidity: Go for mid-range rigidity for the perfect all-rounder ski. Light and fluid, a mid-range rigid ski will be perfect for ‘’all mountain skiing’ no matter what the snow quality or terrain. Weight: A light flexible ski is always best for beginners but choosing an average weight ski will take you happily through the powder in January to the different ski types all the way through to the end of the season. Length: Go for mid-length freerider skis if you prefer untouched snow and usually avoid the smooth grooming pistes in resort. Those who love freeriding will need quite big skis with a blade wider than 90mm. Rigidity: Just like with skis made for downhill skiing, the best rigidity for skis to be used mainly freeriding will be dictated by your standard, physical condition and what you want to achieve. Rigid skis with a normal camber and flat tail will give you more speed and stability, whereas skis that are more flexible and have a reverse camber will be a lot more fun. Weight: Light flexible skis are best for those buying their first pair of skis, and will prove more easy to throw around a park if you like freestyling too. Every ski you choose, whether it’s your first pair of skis or your tenth, is a compromise between ease/forgiveness on one hand, and power/speed on the other. Juggling between quick-turn agility and stability in challenging conditions is a battle lots of people face when choosing which pair of skis to buy! However, we hope that we have explained a little more about the intricacies involved in buying your first skis, let us know what things you like to consider in the comments below, or over on Facebook or Twitter. We look forward to hearing from you!